Swimming with a Blue Whale – We were only yards away! There are some countries in the world that have that little extra something, that appeal that draws you back like a super magnet. Sri Lanka is one of the countries I find difficult to be away from for very long. They have everything – jungles, wild animals, history, fascinating people, long beaches and exciting underwater scenery. It’s never hard for me, as a filmmaker, to find a story on this paradise island. My latest trip, in March-April, was my 30th visit to Sri Lanka. I have often been there over extended periods, maybe 2-4 months at a time, working on various film projects. My first visit to this paradise island was in 1980. Sri Lanka was, at that time, a somewhat primitive country with rough, narrow roads and people doing hard labor with simple tools. A country not yet industrialized but still maintaining the unique culture of a fading colonial era. Now, in 2017, Sri Lanka is a modern country with well-developed roads and transportation. People live much like we do in Europe, for better or for worse. For me, one of the more disturbing “modernizations” is the ever-present television that can now be found even in the simplest homes in rural Sri Lanka. People have succumbed to the same social paralysis that affected us in the 1960’s, staring at a moving picture on the screen rather than visiting and talking with each other. Even if they don’t have time to sit down and watch, the television is left on as some sort of artificial companion or status symbol. Of course, television, correctly used, can be a great source of entertainment and information. This spring I and my wife and colleague, LaVonne, were in Sri Lanka to film the final scenes for our new film, a story about the Ahikuntaka people, and to gather more material for our new book about Sri Lanka. First we visited Kudagama, a small village about 30 minutes drive south of Anuradhapura. When I came to Kudagama the first time to film in 1982, the village was little more than a cluster of huts made from mud, sticks and leaves. Most alarming, however, was the obvious alcohol problems in the village. Virtually 100% of the people from the age of 10 years old were alcoholics, drinking large quantities of the cheapest alcohol called Kasippu. Terrible violence and riots broke out daily. I think it could best be described as “Hell on Earth.” In our coming book and the film “Ahikuntaka – The Children of Paradise” I’ll describe more about working in the village at that time. Since that first visit in 1982, I have followed the Ahikuntaka people throughout the years and seen the village develop and change. This spring we spent several days in the village, interviewing the elders and visiting with friends. No longer a hell on earth, it is now closer to paradise. What brought this change? I’ll tell you more about that later. After our visit in Kudagama we traveled to Sri Lanka’s east coast to film and photograph the marine national park, Pigeon Island. The national park is a popular destination and the coral reefs surrounding the island have been damaged and destroyed by the many tourists walking in the bay, breaking off the delicate corals. Although Pigeon Island is worth a visit, the real excitement is to be found just outside the national park in the deeper water where the Sperm whales and Blue whales feed. 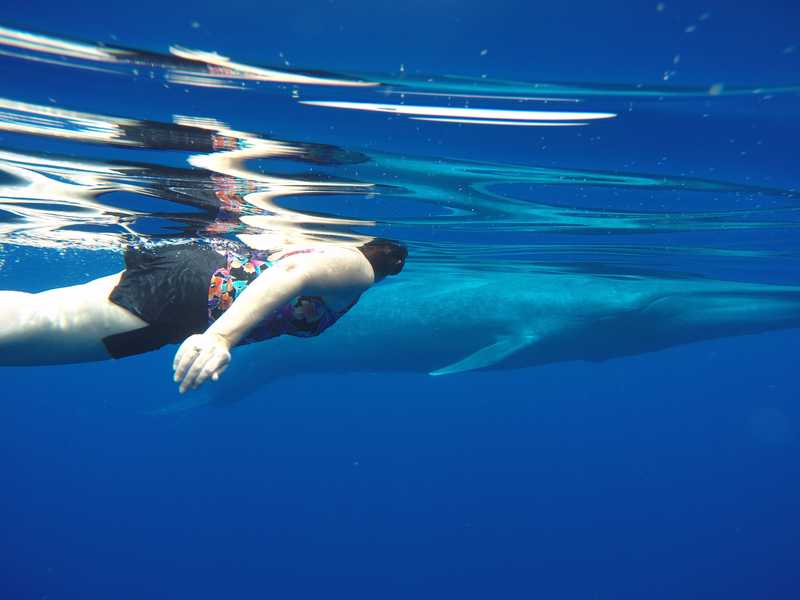 We dove at several beautiful sites that week, but one day we were snorkeling in deep water when a Blue whale swam straight towards me. (The Blue whale is the largest creature to ever live on earth.) His enormous body was just a few yards in front of me when he slowly dove into the bottomless depths. The intensely blue water, laced with rays of sunlight, engulfed the whale as it was slowly sunk into the depths. It was magical. Swimming with that gentle giant in his own environment is an experience I’ll never forget. Coming this fall, 2017, the film “Ahikuntaka – The Children of Paradise” and a book about my favorite places on the paradise island, Sri Lanka.